Your best one yet! Sure brings back a wonderful horde of memories; I travelled 150 nights out of the first 320 that year but only BDA, PAR, BER, MBJ, NAS/MIA, ROM, BOS and JFK with the global insignia on the tail! Pan American World Airways played such an important part in the world of aviation that many airlines today are still envious of this defunct airline’s history. Talk to anyone about Pan Am and they’ll tell you a story either good or bad but, they still remember this company with fondness. Thanks for your comment. It rings so true. If you look at my earlier blogs, you can see how PAA led the way. Even to the point of addressing the pilot-in-command “Captain” and the use of nautical terms and procedures was a Pan Am idea that carried on. Juan Trippe had an affinity for things nautical…..and one thing led to another! Thanks again. Does anyone know the names of the entire flight crew? Thanks for your inquiry. I can ask around, perhaps Gil can help…. 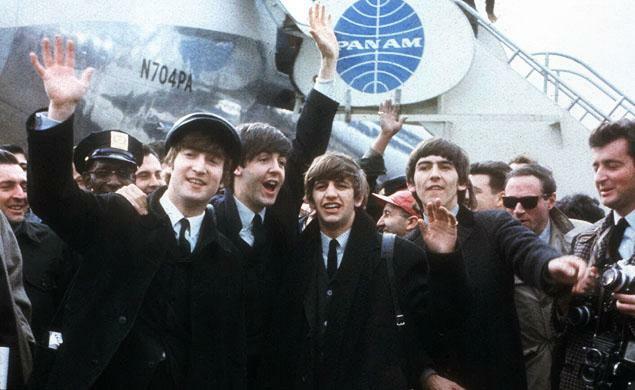 Love the series but I think the band in the photo at the lower right is not the Beatles, it’s Led Zeppelin and based on the leis around their necks I’m guessing Pan Am flew the band to Hawaii before they got their own personal airplane, the “Starship,” a Boeing 720. Thank you from a Led-head and Pan Am admirer since my days of watching the regal looking PA 707s taxi in at Caracas where I lived for a few years. No other airliners from any other airline got people’s attention like the Pan Am flights and their arrival was even announced on local radio every day. Thanks. You are right. There was a sense of something special or an adventure connected with Pan Am departures/arrivals. It was like watching an ocean liner depart the pier.